The Get Along Gang are characters created in 1983 by American Greetings' toy design and licensing division, "Those Characters from Cleveland" (now American Greetings Properties), for a series of greeting cards. The Get Along Gang are a group of 12 (later 14 year-old) pre-adolescent anthropomorphic animal characters in the fictional town of Green Meadow, who form a club that meets in an abandoned caboose and who have various adventures whose upbeat stories intended to show the importance of teamwork and friendship. The success of the greeting card line led to a Saturday morning television series, which aired on CBS for 13 episodes in the 1984-1985 season, with reruns showing from January until June 1986. Each of the characters also has obvious faults, which they learned to overcome with the help of friends. For instance, Montgomery Moose, the group's leader, is quite clumsy; Woolma Lamb is extremely vain and self-centered; Dotty Dog could be careless; Zipper Cat could be overbearing, Portia Porcupine could get upset easily; Bingo Beaver could be greedy and tended to get himself and/or others into trouble (although he was not mean-spirited like the Gang's villain, Catchum Crocodile). Montgomery "Good News" Moose (voiced by Sparky Marcus) - The leader of the Get Along Gang. He is very nurturing and kind, and knows what is right or wrong, although he is sometimes awkward. Montgomery is also very well-rounded: he excels in athletics, tinkering in electronics, and science. He wears a blue turtleneck, yellow pants and brown loafers. Dotty Dog (voiced by Bettina Bush) - A cheerleader and second-in-command to Montgomery. She is very optimistic and always has a way to cheer things up, although she is sometimes not careful and quick to judge some things at some point. She wears a white and red cheerleader outfit, white socks and black and white sneakers. Woolma Lamb (voiced by Georgi Irene) - An aspiring ballerina. She seems to be defined by her vanity and beauty, and is often seen carrying a mirror to admire herself. Sometimes, she can be selfish and irrational about things, but would stand up for others. She wears an entire yellow outfit consisting of a dance dress and ballet slippers. Zipper Cat (voiced by Robbie Lee) - An athletic feline who excels at sports. He often plays the "tough guy", which sometimes shows that he is also cynical; however, he remains friendly to the rest of the gang. He wears an orange sports jacket over a blue turtleneck, matching orange shorts, white socks and orange tennis shoes. Portia Porcupine (voiced by Sherry Lynn) - The youngest member of the Gang. She is very inquisitive, curious and likes her own style, but tends to cry or throw tantrums when frustrated. She wears a white shirt, blue folded jeans (denim shorts in the 1984 special), and black and white sneakers. Bingo "Bet-It-All" Beaver (voiced by Scott Menville) - A prankster and gambler whose bets and mistakes sometimes cause his friends to be angry with him; on the other hand, however, he enjoys being with his company. He wears blue overalls which carry a red scarf inside a pocket, and black and white sneakers. Braker Turtle (voiced by Frank Welker/Don Messick) - A smart problem-solver. In contrast to his real-life species, he is also the fastest runner in Green Meadow. He enjoys being hip, despite his nerdy appearance. Braker makes occasional speaking appearances in the DIC cartoon series, usually as a friend of the gang, but did not appear to be a full-time member of the gang. He wears a blue jacket over an orange turtleneck, white pants and blue shoes. Rocco Rabbit - A reformed bully with a tough exterior. He wears a red shirt, blue jeans and yellow tennis shoes. Rudyard Lion - A foreign-exchange student, who has a crush on Woolma. He wears a magenta Hawaiian shirt, orange pants, black and white sneakers and a black hat. Flora "Forget-Me-Not" Fox - An avid botanist and photographer. She is extroverted, rather the one not to hide her feelings, despite appearing shy to others. She wears a yellow collar shirt under a sky blue dress, matching socks and mary janes. Bernice Bear - A very sensible girl who likes keeping things neat and tidy. She enjoys baton twirling and is also proficient in cooking and sewing. She wears a pink sweater over a white blouse, blue shorts and brown loafers. Lolly Squirrel - The rich daughter of the candy factory owner. She has good manners, yet tends to be a bit of a tattletale at times. She wears a red cardigan over a pink dress, white socks with red mary janes, and a matching beret. Hocus Hare and Pocus Possum - A pair of magicians. Hocus wears a pink dress over a yellow blouse and under gray coattails, and pink dress shoes. Pocus wears red coattails over a gray dress shirt, blue pants, and black shoes. Catchum Crocodile (voiced by Timothy Gibbs) - The show's main antagonist. He is a constant troublemaker who is always trying to take whatever he wanted, regardless of whose it was, sometimes through bets with Bingo. More than once, he had tried to steal the Gang's clubhouse caboose. Leland Lizard (voiced by Nicky Katt) - Catchum's sidekick. Although he is rather dopey, he is not always as dumb as he looked, and is sometimes especially sneaky. In the pilot, he was able to change color, but he showed no such ability in the series. Both of their outfits suffer from recoloring or discoloring issues. Officer Growler (voiced by Don Messick) - A bulldog police officer. Mr. Hoofnagel (voiced by Don Messick) - An old goat who owns and operates the local ice cream parlor. Miss Deering (voiced by Sherry Lynn) - A deer and the kids' teacher. Susie (voiced by Sherry Lynn) - Bingo's pen pal, a squirrel who likes exercise. Mayor Bascombe Badger (voiced by Don Messick) - The mayor of Green Meadow. Schneider Squirrel - Lolly's father and owner of the candy factory. Schneider appeared only in the Marvel comic book stories. 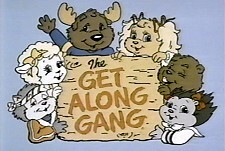 Canadian studio Nelvana, in association with Scholastic Entertainment, Those Characters from Cleveland, and LBS produced a pilot episode of The Get Along Gang, which was broadcast on the Nickelodeon cable network on May 6, 1984. The plot revolved around the twelve members of the gang as they try to win a scavenger hunt despite Catchum's cheating and their own competition-fueled infighting. Although all twelve characters were involved, only the six core gang members (Montgomery, Dotty, Zipper, Bingo, Woolma, and Portia) had speaking roles. Among the voice talents in the pilot were Charles Haid (then of Hill Street Blues) as Montgomery and Dave Thomas (fresh from his days on SCTV) as Leland. The pilot also aired in syndication nationwide during the summer of 1984. John Sebastian, famous for working for Nelvana at the time, wrote and sang for the pilot. For reasons unknown, in between the pilot episode and the series premiere on CBS, production of the series was handed over to DiC Audiovisuel, a French animation studio. Thirteen half-hour episodes were produced, each containing two eleven-minute segments. As with the pilot, the focus was on the six core members of the gang, with the other six members making very sporadic appearances. Out of those six, only Braker Turtle had a regular speaking role. The show returned to CBS in reruns from January–June 1986. From September 1986 until August 1987, all thirteen DIC-produced episodes were rerun as part of a short-lived syndicated cartoon package called Kideo TV. Reruns of the series later aired on The Family Channel (now Freeform) from 1990–1993 and on the children's programming block of Pax TV (now Ion Television) from 1999–2001 the Pilot Episode of the 1984 The Get Along Gang aired in the year 2000 on other syndicate channels. The brief series spawned a large range of merchandise and spin-off projects including stuffed toys and action figures made by Tomy and a series of storybooks published by Scholastic Press. The Tomy action figure line and Scholastic Press books actually lasted longer than the DiC cartoon series itself. The characters were also adapted into comic books. In America, their series, which ran for six bi-monthly issues in 1985 and 1986, was published by Marvel Comics' Star Comics imprint. In the United Kingdom, Marvel UK published a weekly Get Along Gang comic, which ran for 93 issues from April 1985 until January 1987. In mid-to-late 1985 the toy and greeting card sales began to decline, the first sign of the Gang's popularity waning. A few products (plastic figurines, some greeting cards, and a coloring book) were released, with Hocus Hare and Pocus Possum joining at the tail-end of the Gang's run. The greeting card and toy line ended in 1987, and the Scholastic book line lasted for some additional time. In mid-2004, the Joester Loria Group, a licensing and marketing agency, announced the addition of The Get Along Gang to its stable of classic properties. Plans called for the availability of merchandise, such as clothing, toys, games and home decor; this relaunch never materialized. In 2005, American Greetings started plans for an official relaunch of the franchise, which was going to feature 5 new characters: Mogo (a moose), Reagan (a dog), Hatch (a cat), Mayfield (a lamb) and Domino (a beaver), accompanied by an elderly Portia Porcupine, now named Mrs. Bristlemore. There was even a CGI pilot in development at Richcrest Animation (an unfinished version of this pilot has been posted online). However, for unknown reasons the planned revival was shelved by late 2007, shortly after American Greetings refused to approve the original DVD release of the series. Karl-Lorimar released the Nelvana pilot on VHS shortly after it premiered on television in 1984. During the show's run, Kideo Video released several VHS tapes that included select episodes. In April 2007, plans for a DVD release of the series were announced by S'More Entertainment (who released The Littles, another DIC series, to DVD); however, the planned release was announced to be cancelled a month later because American Greetings, who owns the property (and thus had the final say on the matter), would not approve it. Before the announcement of the cancellation, a representative of S'More stated that it was unlikely the release would include the pilot episode, since it involved royalty issues with Nelvana (producer of the special) and with John Sebastian (whose performing in the episode required music clearances). On July 19, 2011, Mill Creek Entertainment released The Best of The Get Along Gang, a 1-disc set featuring 10 of the 13 half-hour episodes (20 of the 26 individual stories). The episodes not included on the set are Nose for News, Camp Get Along, School's Out, The Bullies, That's the Way the Cookie Crumbles and Snowbound Showdown. The remaining episodes were released on 2012 as bonus material of other Mill Creek's DVD releases, Camp Get Along and School's Out are included as a bonus feature on Mill Creek's DVD of Heathcliff: Season One, Volume One released in February 2012, and the other four stories were released in October 2012 as part of a 10-disc DVD compilation titled TV Toons to Go. They later re-released the whole series as a complete series set with 2 discs in that set. While the characters' popularity was strong only in the United States, the series was released in several countries and dubbed into local languages. In Spanish, the series was translated as La Pandilla Feliz (The Happy Gang) and aired on local channels in Colombia, Mexico, Costa Rica, Venezuela and Chile, but did not have the same impact or popularity of other 1980s cartoons. In Brazil the series was translated as A Nossa Turma (Our Gang) and was a modest success running on SBT during the late 1980s and early 1990s. In France, it was known as Les Amichaines. The series also aired in the United Kingdom in the late 1980s, where it was a modest success too, also generating merchandise in the country. ^ a b Josephson, Nancy (1983-06-20). "Get Along Gang gets '84 push". Women's Wear Daily (WWD). Fairchild Publications (145): 14. ^ Novak, Ralph (1986-05-19). "The Get Along Gang". People Weekly. Time Inc. (25): 14. ^ Evanier, Mark (1997-08-08). "Edition #145". POV Online. Retrieved 2010-08-25. ^ Kitchen, Jane (July 2004). "Licensing show bustles; classic brands continue comeback". Home Accents Today. Reed Business Information. 19 (8): S10. ^ "The Joester Loria Group to Launch American Greetings' Get Along Gang". New York City: The Joester Loria Group. 2004-06-08. Archived from the original (Press release) on 2004-08-08. Retrieved 2010-08-26. ^ SACKS (2006-06-01). "SACKS10: THROWBACK THURSDAY 18". Sacks10.blogspot.com. Retrieved 2013-12-17. ^ Lambert, David (2007-05-26). "The Get-Along Gang - It's A Sad Day When We Can't All Get-Along: DVD Cancelled!". TVShowsOnDVD.com. Archived from the original on 2007-09-11. Retrieved 2010-08-25. ^ artysf (2007-05-01). "Yahoo Groups". Groups.yahoo.com. Retrieved 2013-12-17. The Get Along Gang at Don Markstein's Toonopedia. Archived from the original on August 24, 2016. This page was last edited on 10 March 2019, at 13:45 (UTC).